– Put water on the seed tray and wait for the water to run out, the goal being to moisten the seed tray and the wheat. 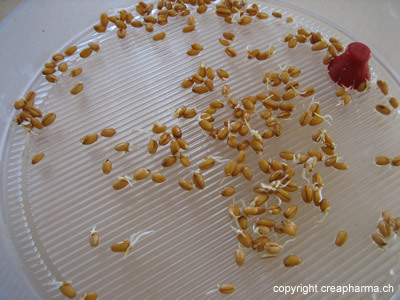 – To halt growth, place the wheat germ in a box in the fridge. – Chew the wheat germ, swallow it. It can also be chewed until it reaches the consistency of chewing gum, then swallowed. Eat one to two teaspoons per day.